The Fellowship was fortunate enough to obtain a copy of DARK SHADOWS: THE VISUAL COMPANION from Titan Books. The book is written by Mark Salisbury and includes a forward by Johnny Depp, an introduction by Tim Burton and an afterword by the late producer Richard D. Zanuck (this was his last film). THE VISUAL COMPANION chronicles the filming of the classic 70’s gothic soap opera being remade into the 2012 film. It includes all aspects of the film: costume and makeup, set design, scoring, casting, etc. Mr. Salisbury had access to the set, cast and crew to give a complete look at putting the film together. Burton’s films can be hit or miss with me, but I love his visual style. This book captures it in a beautiful way. The photos are striking and it’s funny how the colors pop out of the images considering how the atmosphere is so dark. The cast and crew interviews are interesting and seeing the sets, special effects and costume designs was a treat. There is no stone left unturned with this book, including a look back at the film’s inspiration…the original television series. If you loved the movie, a fan of the Burton style, or simply want to know what goes into a modern film, you should check this out. 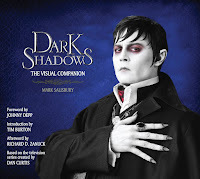 DARK SHADOWS: THE VISUAL COMPANION is in bookstores now and available at www.titanbooks.com.